With the advent of spring, and everything coming back to life after a (not so) long winter's sleep, what could be a more fitting story to choose as Var GladSpexarna's spring production, than Frankenstein. Apart from the regular tasks given the tech department, there was also a request for a "battery meter", technically a bar graph display with six lights, large enough to be a noticeable prop on stage, and with a design that could fit into the lab of Frankenstein. The set construction department furnished us with a sturdy box to mount the electronics in, leaving me to work out the electronic details. 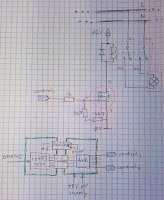 This effectively meant repurposing the firmware of the by now proven DMX512USB card to control the switching of six lights, and to design a relay circuit suitable for switching mains power. 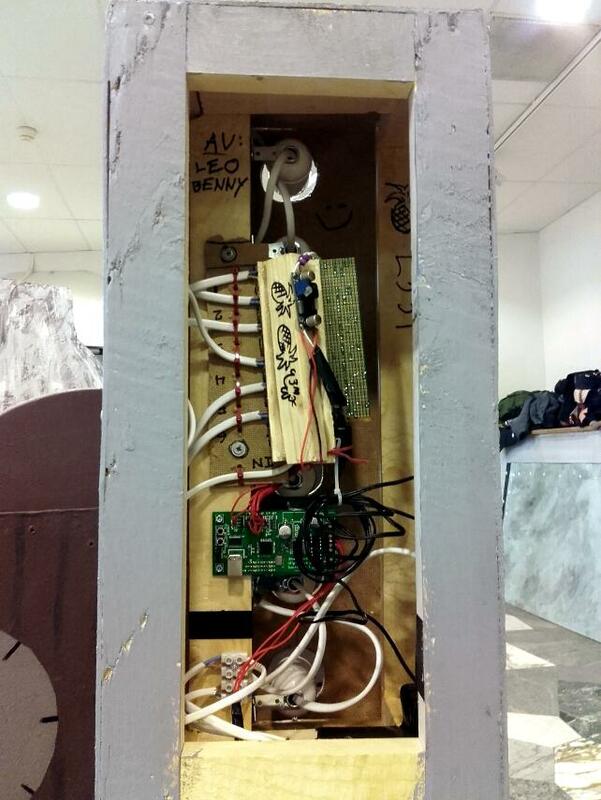 The duty cycle of the construction is low and it's not switching a lot of power in the first place (not likely to be or become a fire hazard), and the whole thing is to be mounted in a box that is screwed shut (no accidental access), but there are still design parameters that have to be considered because of this. 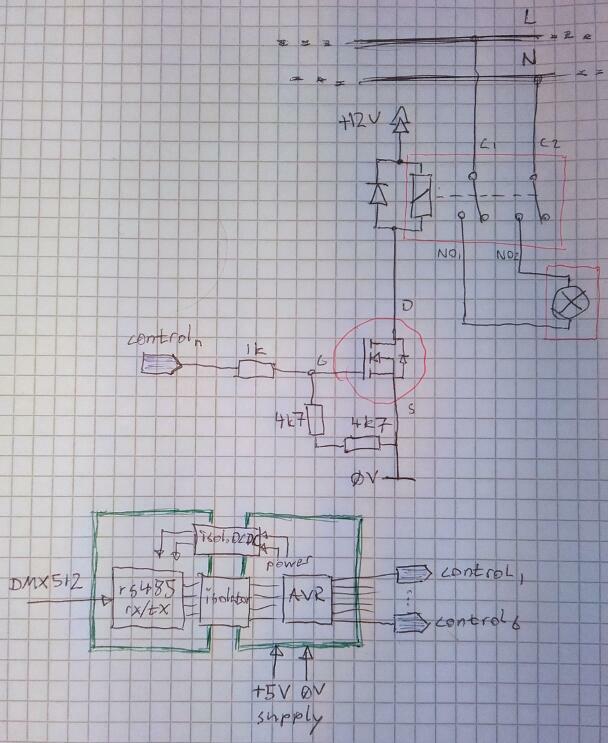 The DMX512 interface card was built with electrical isolation in mind from the start, so from a design standpoint not much changed in the schematic from previous iterations, more than selecting DPST/DT relays rather than SPST/DT ones for switching the lights. (Wall sockets in Sweden are not polarized, so we can't rely on a specific mains level conductor in a device being live or neutral.) Other measures included paying attention to the wire gauge used and isolation distance, and making sure that there would be no accidental touching of anything conducting mains power even with the cover open. 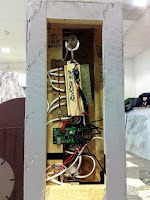 A lot of the work pertaining to mount the lamp sockets in the box, as well as the soldering of the relay circuit once the components arrived, was taken care of by Benjamin Claréus, who for that matter is one of the guys that participated in the original LED bar soldering workshop, and has helped out with similar tasks since then. Although I provided supervision and guidance, this freed up time for me to try to locate and adapt the latest working interface card firmware revision. He also pitched the use of carbon-filament lamps rather than regular bulbs, something that I had initially written off due to their higher cost. The end result speaks for itself though, and regular bulbs, especially now that they often contain a small halogen bulb inside, would not have been the same.